In the US alone there are 139 Million miles of railroad track. What if we could re-purpose the track so that it could be used to ship more tonnage during off-hours or gaps in normal commuter or freight train use? Cambridge R&D has recently developed intellectual property to address this very topic. The solution entails the creation of autonomous, electric rail cars that independently and simultaneously carry cargo between any way-point, in any direction, while the track is unused (off-hours or between normal traffic). The cars have the intelligence of today’s electric vehicles (think “Tesla on a track”) but can also be controlled via an operations center or locally. Using this intelligence, the cars interact with each other and with the track infrastructure, allowing them to start and stop at track crossings as traffic demands or work in unison should the need arise. To avoid issues with standard rail use, such as commuter or freight trains, the cars also employ specialized capacity to quickly derail which facilitates not only the ability to clear the track but other loading and offloading requirements. In addition, the railcars can be loaded with specialized containers that act as UAV (unmanned aerial vehicle) delivery platforms. 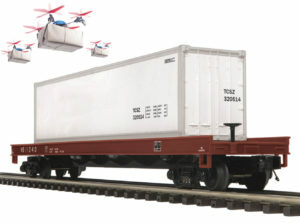 This allows UAV’s to deliver and retrieve packages within the flying radius of the railcars. The platforms also provide UAV recharging and can communicate with the UAV’s to facilitate swarming patterns that allow the UAV’s to land and recharge from any platform. Rough analysis of the mail railway line from Boston, MA to Manchester, NH highlights the capacity of the rail-based, UAV delivery swarm approach. Given a 5 mile flying radius (2.5 miles to either side of the track), over 5 Million residents are reachable for delivery and pickup of packages.